Posted on Thursday, September 6th, 2018 at 11:10 am. Is your business in Google’s ‘Local Pack’? This refers to the top three listings showcased during a relevant search. Statistics show how valuable this position can be, with the first result receiving 33.55% clicks per search, the second 14.96% per search and finally 9.3% clicks per search. So how do you make it into the top three businesses showcased in Google’s Local Pack? There are three different criteria to rank the listings and dictate who will appear in the Local Pack. 1.Relevance:how much does a local listing matches what someone is searching for? 2. Distance:how fair is each potential search results from the location term used in a search? 3. Prominence: how well-known is a business? First of all, you MUST have a Google My Business listing. Complete all of the information fields and most importantly, verify it! This will give your business credibility. 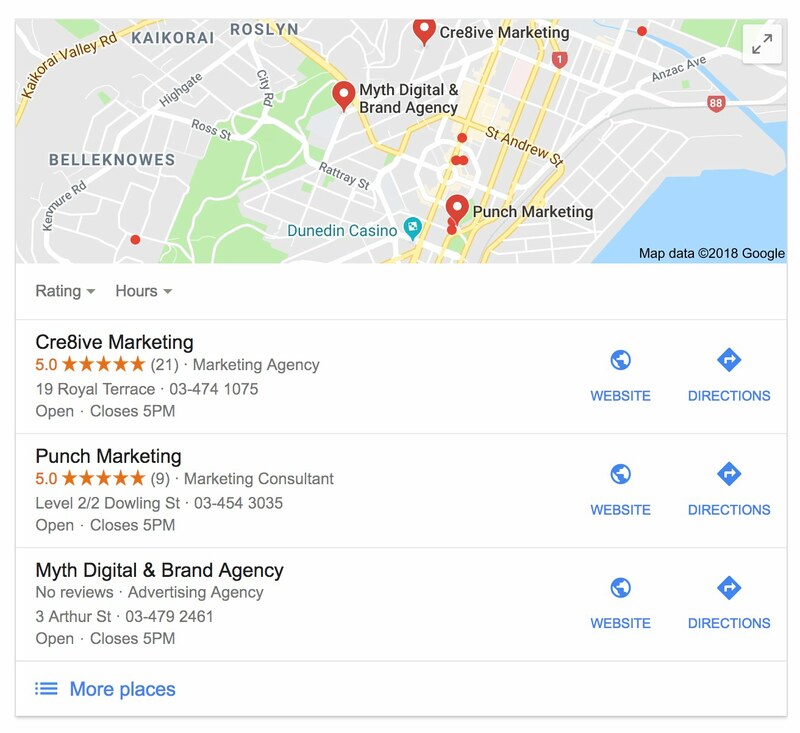 Here are the top five tips to optimise your Google My Business Listing to give your business the best chance of showing in the Local Pack. Focus on receiving positive reviews. Google highly values the amount of reviews a website gets, if they are positive, and if the company responds. List your business on as many relevant, local directories as possible. The more citations you have on other websites and directories, the more prominent your business will become. Ensure your NAP details (name, address and phone number) are identical as this will create more credibility and weight behind your business in Google’s eyes. Focus on earning local backlinks. Local Search Engine Optimisation (SEO) relies far more on local backlinks than usual SEO, so make a target of getting mentioned and linked in a particular number of other local websites relevant to your own. For example, if you were a cafe in Dunedin, it would be hugely advantageous for your SEO if you could have an inbound link on a Dunedin tourism website, or on the coffee supplier’s website that you use, so visitors will know you are a local stockist of a certain coffee or other product. Make sure all pages of your website, your NAP details are identical to those entered in your Google My Business listing. To further increase your rating, embed a Google Map with a business marker into your landing page. These improvements to your website are important because Google’s new blended algorithm that it introduced in 2015, now takes into account your website’s SEO rating as well as your Google My Business listing. Sync your Google My Business description and your website’s landing page so they both contain relevant keywords and NAP details/Google syncs all these details with the amount of reviews you have and the amount of citations/backlinks you have, and they will start working together to give your website a better chance of ranking higher.